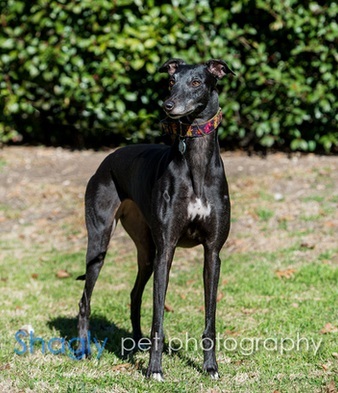 Izzy, formerly Charlotte, is an approximately 6-year-old black female. She has no tattoos so her age is estimated. Charlotte was originally found as a stray in a vacant field within the Grand Prairie city limits. 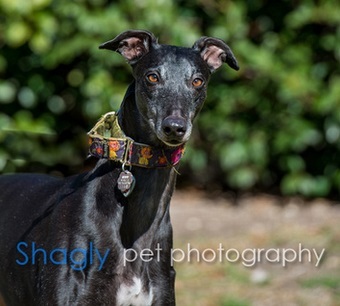 Izzy was in a home for four years, but has since returned to GALT due to no fault of her own. She loves to give kisses! Izzy gets along well with other large dogs. She is not recommended for a home with cats or small dogs at this time. Izzy is an incredibly smart and loving hound. She likes to be with others whether they have 2 legs or 4. She is not cat tolerant nor is she good with dogs smaller than about 20 pounds, but she does wonderfully with our other greyhound. Izzy is a total snuggle bug and is a bit sneaky about wanting up on the furniture. We don't normally allow any dogs on the furniture, however she is very accustomed to being up there, apparently. During the day she is found on her dog beds. Every morning we wake up to her on the couch. Her favorite place to be in the evening is snuggled up next to you. This is one very sweet girl but she probably would be most comfortable with another dog for company. She walks on a leash well except when she finds something she wants to stop and sniff or sees a bunny. She is ready to snuggle up in her forever home.